CONROE, Texas (CNS) — Under a bright blue sky, students at Sacred Heart School in Conroe gathered to pray a rosary for a special intercession. 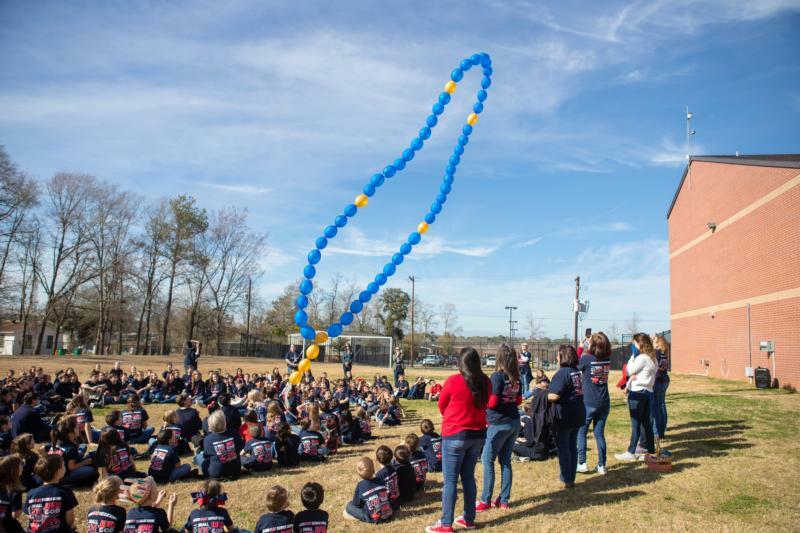 Located 45 miles north of Houston, the school hosted a playground-side memorial service to celebrate and intercede for the life and soul of Victoria Tannos, a former schoolteacher who died of colon cancer in 2017. Two of Victoria’s children, Justin Tannos and older sister Grace Tannos, held onto the blue and yellow balloon rosary with the rest of Justin’s eighth-grade class. Though emotions were high for much of the school staff and faculty — many wiping tears between prayers, and at times the siblings embracing — the two were smiling after they let the balloons fly high into the sky after the closing prayer. Former Sacred Hear student Grace Tannos said the Jan. 30 prayer service “meant everything” to her. “Just being able to honor my mom in a different way and remember her in the place that she always was and (my siblings and I) were always taught together,” she told the Texas Catholic Herald, newspaper of the Archdiocese of Galveston-Houston. Grace said praying the rosary reminded her of going to church with her mother. Victoria’s family also was in attendance, standing next to a smiling portrait of the veteran teacher. Husband Paul Tannos said the school community became a second family for them, during Victoria’s cancer treatment and death. Victoria taught throughout her cancer treatment, said Brown. “Every child in the fifth- through eighth-grade, she has taught” during her 10 years at the school. Brown saw the memorial service as a reflection of Catholic education, especially during Catholic Schools Week Jan. 28-Feb. 3. The students all knew the rosary, how it’s a prayer for everything in life, in sickness, in celebration, or for the end to injustice like abortion or to honor Mary, she said. The service — which saw the balloon rosary fly freely for the first time, the last two attempts during recent Catholic Schools Weeks ended in the trees or the school’s weather vane — also helped students see the parts of life, she said. The day’s events, which began with morning adoration, were part of the school’s five-day celebration of Catholic education during Catholic Schools Week, including Mass with grandparents, acts of service, vocations and teacher-versus-student athletics.